Fire events have their own risks including ‘fire soot’ that contains chemicals like formaldehyde (used in embalming). Fire Soot is extremely acidic and if these soot chemicals remain on your business’ walls, ceilings, air ducts, furniture, and vents of your structure they can begin to permanently affect them. Here at SERVPRO® of River Oaks we work hard for you to restore your structure to its preloss state. We are available to help you bypass any restoration project planning and reduce the overall cost that is required to restore your building back to its preloss state. A timely response can also decrease the exposure duration to unhealthy conditions that could cause sickness to anyone who enters the premise. Make sure to call SERVPRO® of River Oaks at (713) 666-9222 if your business is affected by a fire or water damage. Why is SERVPRO of River Oaks a Trusted Insurance Professional? 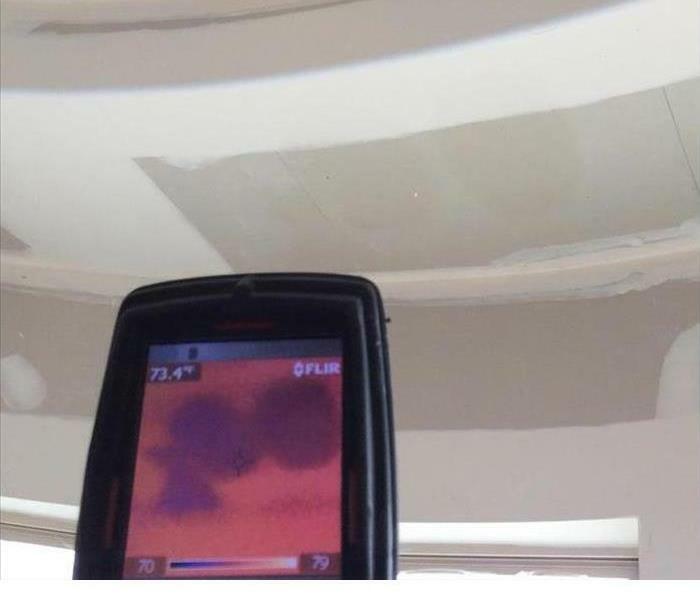 Example of how we use an infra-red camera to assist with discovering hidden water damage in walls and ceilings. Why SERVPRO® of River Oaks? As an agent, adjuster, or any kind of insurance professional, you have a number of responsibilities. Of these responsibilities are recommending reputable service companies to your clients as well as keeping claims costs down for your company. SERVPRO® of River Oaks is a highly qualified and trustworthy company that fill many needs to your clients when they find themselves in the middle of a fire or water loss. Arriving at a loss in a timely manner reduces damage and therefore reduces the cost of restoring damaged property. 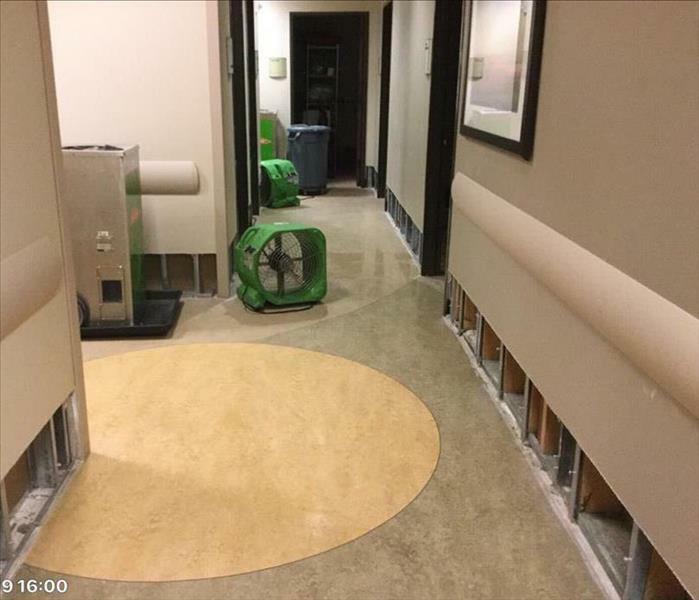 An immediate response is vital to limiting damage, and SERVPRO® of River Oaks strives to arrive on the scene as quickly as possible. This falls in line with taking care of both the home or business owner in conjunction with limiting costs for the insurance provider. Replacing property is far more costly than restoring property. Pretesting is a necessary step in the restoration process to determine the level of damage and dictate the necessary actions to begin restoration. A lack of pretesting could cause the quality or scope of the work to diminish which leads to unhappy clients. Your SERVPRO® of River Oaks professionals will always pretest the site in order to determine the extent of damage and the proper course of action to restore the property. Proper training is ideal for providing your clients the best service possible. Your SERVPRO® of River Oaks franchise professionals are trained to industry standards in Fire and Water cleanup and restoration. Additionally, SERVPRO® of River Oaks hosts continuing education classes available periodically to insurance professionals as well as our franchise professionals. Timing, pretesting, and training are just a few of the reasons that insurance professionals and companies can trust SERVPRO® of River Oaks to take the best care of their clients while limiting costs by restoring in place of replacing property. While any disaster is tough to cope with, large loss incidents present a unique set of challenges. The breadth of damage is larger, and the resources required for repair are equally inflated. It’s key that you get the right team to handle your catastrophic loss or things could get worse. Know what to look for in a large loss team – follow these tips. These events require a higher magnitude of the response due to size and resources needed. While any local cleanup company can claim they know large response, only a few truly have the experience. Ask a prospective cleanup partner for specific examples and strategies used in a wide breadth of disasters. This can help you determine if they can handle your catastrophic loss. A big loss requires a big response, and that won’t come from a ragtag team. Make sure your prospective partner has a good-sized staff trained to properly respond, manage the project, and restore the affected structure or structures. Flooding can cause major damage to your property in just 24 hours or less, so it’s critical that a disaster response team assess the damage and formulate a plan quickly. Make sure to choose a cleanup partner able to arrive within an hour of your phone call. The way you handle a large catastrophic loss can have implications for years to come. Make sure you do things the right way. Use the above tips to find the right cleanup partner and you won’t regret making the wrong decision. The death of a loved one is a devastating event for family and friends. When a person dies in the home or at a business, the cleanup afterward can prove too traumatic for family to perform. Outdoor scenes of death are often cleaned by a fire department, but if someone has died inside a building cleanup needs can be extensive. Odor, blood spills and tissue remains may need to be removed. Specific procedures should be followed to ensure permanent remediation, allowing dignified closure of a painful chapter. Always confirm professional cleanup services are certified or licensed in accordance with your state regulations for death-related cleanup projects. Instructions included in this article are intended as general guidelines and do not constitute training or certification in biohazard cleanup or removal. Always wear OSHA-compliant protective gear when cleaning up biohazardous materials, including blood, brain matter, feces, vomit, and decomposition seepage. Additionally, there are more than 10 Extreme Response Teams within SERVPRO® who are ready to head out at a moment’s notice. These teams are often made up of multiple Large Loss Response Teams, and they are the highest tier of disaster response at SERVPRO®. These elite teams can handle losses of $500,000 or more and are strategically placed around America so that they can act quickly when they are called into action. 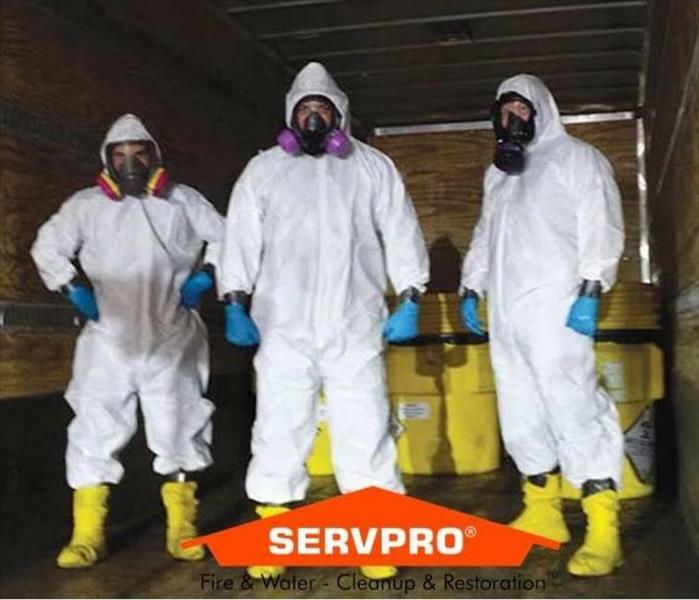 With so many SERVPRO® franchises, Large Loss Response Teams, and Extreme Response Teams around America, it is easy to see why we are a leader in the restoration industry. No matter where you are in the U.S., we will be there in a flash to help get your life back to normal. Simply give our office a call at 713-666-9222, and a team will be dispatched to your location! For more information on the services we offer, email SERVPRO5673@SERVPROofriveroaks.com. SERVPRO® of River Oaks offers a wide range of services to cover all of your needs when it comes to restoration. Check out the list below to see some of the problems we can take care of! Water Damage: When it comes to water damage, a quick response it critical to preventing further damage. Our experts use state-of-the-art equipment to ensure that your property has been completely dried to IICRC standards. Fire Damage: After a fire occurs in your home or office, you will have to deal with smoke and soot damage as well as water damage. Our technicians can handle even the largest fire loss so that you can have peace of mind during this stressful time. Mold Remediation: Nobody wants mold inside their house, and for those with allergies, microbial growth can cause serious problems if it is left unchecked. Our team of professionals is specially trained and certified to get rid of mold and make sure it doesn’t come back. Biohazard Clean Up: Biohazardous substances such as blood or bile can be extremely dangerous and should always be disposed of properly. We can safely treat any affected areas and dispose of contaminated materials according to OSHA, EPA, and state and local standards. Deodorization: From sewage, to mold, to pet stains, nobody likes living or working in a stinky area. We can locate the source of the odor and eliminate it rather than just cover it up. Contents Claim & Document Drying: We offer pack out and storage services to keep your belongings safe until reconstruction has been completed. We are also able to restore paper documents through the deposition process. Catastrophic Events: Our elite Large Loss Division can handle any size jobs. These teams are strategically located around the U.S. so that we can be on site as quickly as possible after a hurricane, tornado, or other catastrophic event. The fact that mold is unpleasant and can have a musty odor isn’t the only reason to be wary when you first notice it in your home or office. Mold growth occurs when the moisture content of a space is too high for too long. There’s a natural amount of mold spores normally present in most environments, but if the moisture level in a water-damaged environment isn’t promptly returned to normal, mold spores may grow and multiply. Why should all this matter to you? Excessive mold growth can lead to harmful indoor environmental conditions. Learning as much as you can about mold can be your best defense. Do You Have The Right Smoke Detector? Having a smoke detector in your home is critical to making sure you and your family are safe. You should have one in every bedroom and on every floor of your home. You probably already knew how important these little alarms are, but do you know how to make sure that your smoke detector is a good one? Smoke detectors can come in any size and shape, and they can be as cheap as $5 or as expensive as $150, so with all of these options, how do you know what to choose? First, there are two different types of detectors: ionized and photoelectric. Some devices are a combination of these two types. Ionized smoke detectors work best when there are actual flames present. They are quick to sound the alarm when a lot of heat is produced. Photoelectric smoke detectors work well with fires that start slow and tend to smolder and create a lot of smoke. Smoldering fires like these are usually pretty silent, so people do not always notice them at first; some people will actually develop breathing problems and pass out before they realize that a fire is occurring. Both types of alarms are designed to detect fire no matter what, and both will be sufficient to get you and your loved ones out of the house in time as long as you keep up with maintenance such as testing the alarms and replacing batteries when needed. If you feel the need, you can put a mixture of the two types of alarms throughout your house. Regardless of what type you choose, make sure you have them in the kitchen, bedrooms, and any other important places in your home. Stormwater runoff is rain that has not been soaked into the ground, so it flows over the ground until it finds somewhere to go. Ideally, the water would find a stream or river to flow into, but this is not always the case. Sometimes the water will flow straight into your house. Water damage is never fun, and trying to get rid of water as well as clean up the rest of the mess a storm has left behind can be a real hassle. The best way to handle stormwater runoff is to make sure it doesn’t happen to begin with. If you are up for a bit of landscaping, you can optimize your yard to keep stormwater away from your building. Swales: Simply put, a swale is just a type of trench meant to carry water and redirect it away from something important. If you decide to install swales in your yard, make sure they are redirecting somewhere that the water will not cause damage such as a stream or pond. Rain Gardens: These gardens are designed with plants that are able to take up excess water to keep it from flowing freely. They also help filter the water so that the water that does reach ponds and rivers tends to be cleaner than water that has just flowed over driveways and roads. Draining Driveways: Driveways are one of the largest contributors to stormwater runoff. Installing drainage areas on the sides of the pavement or using gravel can help minimize the amount of water that becomes runoff. 3/25/2019 - Did your office suffer a water damage? 3/25/2019 - Why is SERVPRO of River Oaks a Trusted Insurance Professional? 1/21/2019 - Avoid Mold Damage! 1/16/2019 - Do You Have The Right Smoke Detector? 1/16/2019 - What Is Stormwater Runoff ?